With a philosophy like that, I was curious to see what kind of books Home Grown Books would produce to engage the attention and imagination of young readers. I was delighted when I received one of the four book sets offered by Home Grown books to encourage an interest in reading and storytelling in children aged 3-6 years. The Adventuring Set is a collection of seven books filled with watercolour illustrations by artist Case Jernigan. The text is written and edited by Kyla Ryman, a reading specialist, mother and teacher with a Masters in Early Childhood Education. A Place to Live – Where would you live if you could? A castle in a cloud? An ark on a mountain? A balloon over the land? Flying – The character in this book has an interesting idea about flying. Will he be able to think and invent something to help him achieve his dream? Submarine – What will you see on a wonderful adventure under the ocean? What will see you? What Comes Next? – What travels on and under the water? What amazing vessel will come next? A Collection of Characters – Take an adventure into the past and discover a cast of interesting characters from history. Let’s Play a Game – What challenges will you have to overcome to win this game? Small format, soft-cover books are an ideal size for small hands to hold easily. The text is minimal, serving more as a prompt for children to explore the illustrations than as a story. From a language perspective, different books in the set focus on different aspects of language – prepositions, verbs, adjectives, colour – but the focus is certainly more on inspiring young children to explore ideas and stories rather than formal language development. The illustrations are in muted shades which might not appeal to some young children used to the bold colours and vibrant images in many picture books. These books are more likely to appeal as an activity enjoyed by parents and children together, with parents encouraging children to explain and interpret the illustrations and weave their own story from the very open text. 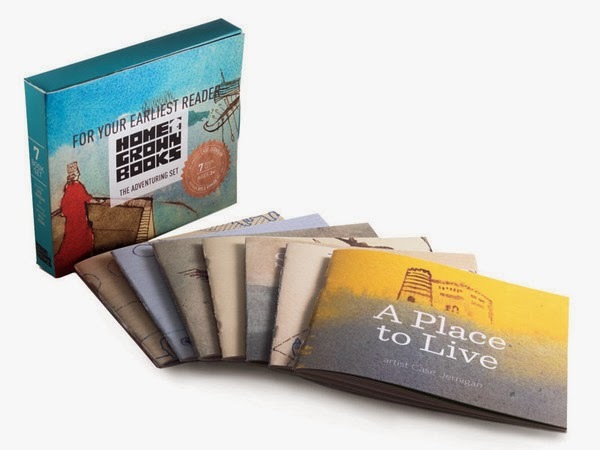 The box containing the books unfolds to reveal a ‘Path to Reading Success’ that offers parents tips on how to get the most from the books and use them to encourage children to explore their own ideas and imagination as well as developing essential pre-reading skills. Home Grown Books is an eco-friendly company based in New York City. Their philosophy includes producing art-based environmentally friendly products that enrich and encourage young readers and create a positive experience centred on exploring words, language and images. I love the concept of The Adventuring Set and I think that parents who are interested in fostering not only a love of reading, but also supporting and encouraging their child’s imagination and creativity will enjoy exploring these books with their children. I can see reading these books sparking a variety of art and creative activities for children as they plot and illustrate their own adventurous ideas.